Hey, look at this! Monday Morning and I have a post. WITH PICTURES! This is what I was doing last week when I wasn't writing. I was off visiting my Granny and Bionic Grandpa! Oh, and gnawing on a bone. 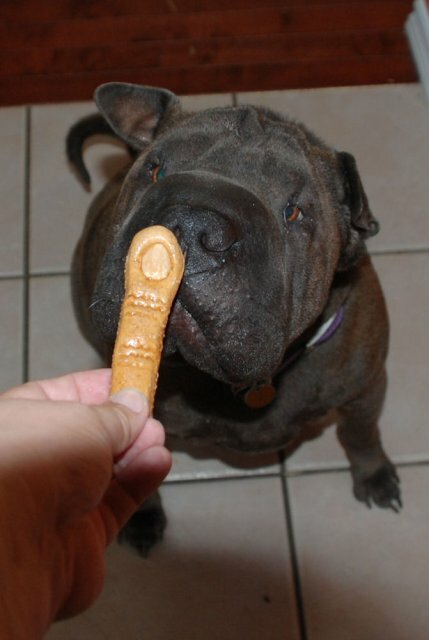 I do that at home too, but at Granny and Bionic Grandpa's house, the bone has other doggy spit on it. I had a great time there. More pictures to come of my Adventures there. Hi! Mom finally let me write on my blog. There hasn't been much to say, except that my ears are gunky. Yeah, gunky. Mom cleaned them. I hate getting my ears cleaned, but at the same time it feels Sooooooooooooo good. Sigh. Anyway, today started off with a nice walk with Mom and Puppy. Dad joined us for a bit but we lost him along the way. Not sure what happened there. I hope he comes back. I'm pretty sure he will, but I'll keep my eyes open and my nose a-sniffin'. Then it was time for a napping trio. Mom and Puppy on the sofa, and me in a sunbeam on the floor. I would have been on the sofa too, but the sunbeam didn't go that far. Puppy needs to learn to nap longer, that's my opinion. Mom's too some days. I've heard her. Once we were all awake, Grandma and Grandad showed up! WHEEE! I got mega ear scratches. Grandma has these nice long nails. Ahhhhh. I love my Grandma. Grandad has enthusiasm when he gives scratches. Ahhhhh, I love my Grandad. So Grandma and Grandad disappeared with Puppy and I had Mom all to myself! WOHOO! Wow, I almost didn't know what to do with her. So I snoopervised her doing stuff. Then Grandma, Grandad and Puppy came home! That was fun. We all had lunch and then Mom said, "Bolo! Fjord!" WOHOO! It's hot out today though, and as you know, I'm a little black Shar Pei. Mom and I didn't go very far. Grandma and Grandad and Puppy kept going, but Mom and I headed slowly home after a while. I'm kind of happy about that. I needed a drool refill. That's an older picture, but you kind of get the idea how fast I can run out of drool. Anyway, I'm now waiting for everyone to come home so I can take care of them. 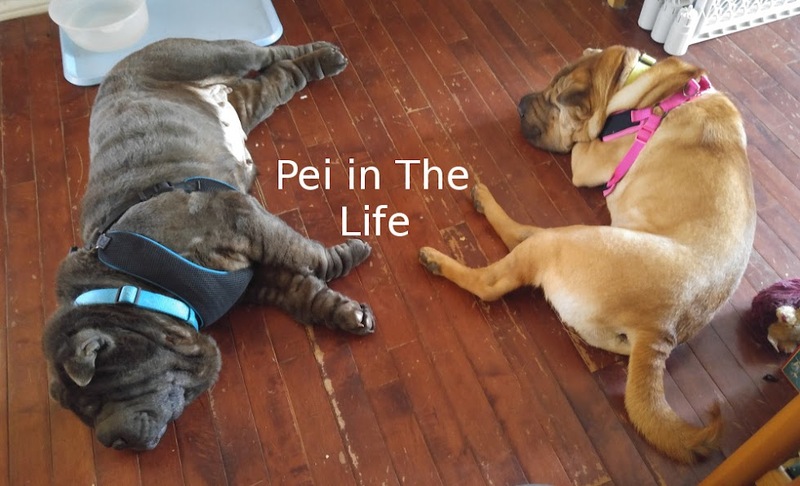 Because that's what Shar Peis do! This ia a photo from last week, but still good. I think anyway. It shows what I'd rather be doing. It's raining here so I'd rather be doing anything but watching the rain come down. It's been an ok Saturday so far, I did sort of kind of growl at Puppy for getting too close to me. Mom said NO and grabbed him out of the way. This time, that NO was meant for both of us. To give her credit, she was reaching to grab Puppy out of my way before I growled. It wasn't a mean growl, it was a mind your own business growl. I'm apprently irristable to Puppy. Somedays I wish I wasn't. 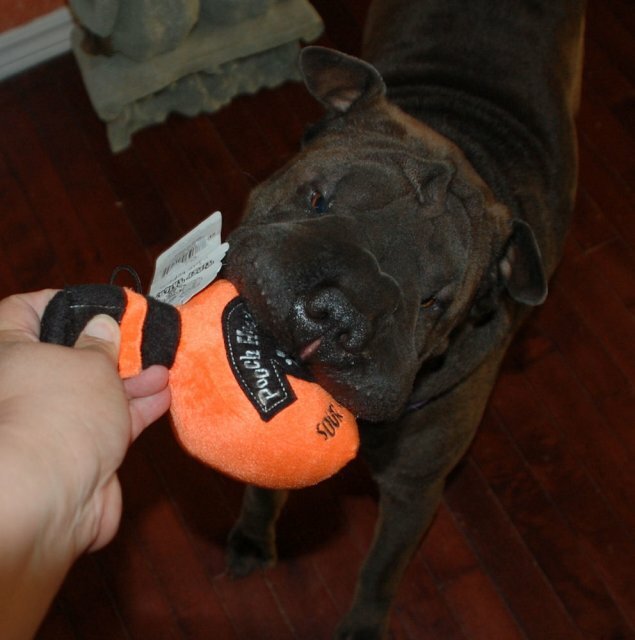 Mom is looking for activities to "Challenge my Mentals" like my good friend Mango the Mastiff is prone to saying. I'm looking forward to seeing what she has planned. I also overheard a phone conversation with my Granny that went something like, "I will also bring the fuzzy one." I am known in the house as the Fuzzy One. Sounds like there is an ADVENTURE in my future! More info on that as it comes to me. It started with Morning walkies! I had to share it with Puppy, but that's ok, I got Morning Walkies! Then I had a chance to have a nap - VERY important to get some energy back after Morning Walkies. Just as I was waking up, Mom and Puppy came back from where ever and we went on Afternoon Walkies! WOHOO! We went to PetSmart where I got to speak to my trainer Tanya. She even gave me some "forbidden" treats. Tanya can get away with it, others can't. I had a nice supper when we came home, then we ran off to rescue Daddy from work! We have now just comes back from Evening Walkies! Ha. I'm exhaustipeited. Well, as you know from my Saturday Post, I had a busy weekend! Sunday was pretty dull, it was raining. ALL DAY. Rain = wet = blech for us Peis. Anyway, I promised I'd post something about Puppy's new X-Pen. Here we go. It's about twice the size of his original kennel. He has plenty of room in there, which leaves my food bowl safe! It also comes apart so Mom and Dad can use it as a gate to block off things like, my door, my food bowl, my sunbeam. Mom said that sometimes Puppy and I just need to be separated. I must agree with her. Other times, like when I'm in desperate need of an ear scratch and he's in Mom's arms, well, then that's ok that he touches me. But he has to do it gently! Mom said so. That's a great picture of me though isn't it? I had the most amazing Noseventure Day! First it started off by taking a good look at my domain. I had to Snoopervise Mom and our neighbour Mr. J moving these into the backyard earlier this week. There were 30 of them. More info on what's going to happen with those when we have it. So this morning, after I had Snoopervised my domain, Mom says Grandma and Grandad are coming over! WOHOO! But I also got to snuffle Grandma - this is a big accomplishment because she doesn't really like to be snuffled. Of course, Mom didn't catch it on on the camera AT ALL. But we all saw it! So Grandma and Grandad stole some of my patio blocks - this is ok, I don't mind because they asked first. S'all good. After that, Puppy and I had lunch together - in our respective eating areas - and then we were off on Noseventure! Doesn't that look like a Noseventure Picture? Mom and Dad picked a great car colour didn't they? I look pretty pawesome in there! We ended up at Auntie Brenda's! Sorry, no pictures. Mom only has two hands and she was holding on to me with one of them and Puppy with the other. Anyway, maybe because she didn't have a third hand, we ended up at Grandma and Grandad's! WOW! They must have really missed me to invite me over. I bet ya Grandma wanted another snuffle and was just too shy to ask. It was a tiring day with all my Noseventures (by the way, they made good use of the 4 patio blocks, I made sure), so Grandad filled up a water dish for me. Then they stuck Puppy in it. Some days I just don't understand people you know? Well I'm still thinking or how I can celebrate my 600th post. Mom also pointed out that my birthday is coming up as well! The two won't coincide, unless Mom helps me write more than 2 messages a day for the next uhm, 30 or so days. I'll try and talk her into it. We'll see what we can do. In the Thankful area though, Thank you Mom for taking me to sniff things at Daddy's office! I had to go through some of my historical photos as Mom thinks that hanging onto both Puppy and I is WAY too much of a handful so she didn't bring the camera. Anyway, she took my sniffing giant squirrel holes! First of all, I'm fine. I've been busy getting oodles of cuddles the last few days. It's been kinfa of slow in the cuddle department since Puppy showed up, so I've been absorbing the recent cuddles to fill up my cuddle defeicit. Thirdly, I'm fast approaching my 600th post. I want to hold a contest. What kind should I have? I need some ideas. I had to take care of Dad all weekend, he's doing a little better now. Then I had to snoopervise Mom and Puppy this whole week. Now I'm not feeling 100%. I have an owie. But I'm also exhaustipeited from looking after everyone else this whole week. I need to recharge. Any ideas? I've been super cuddley, hoping that will help me energize. It has, kind of. But I think I need more. The other day Mom got just the right spot in scratches and I just had to let her know so I did that cute leggy thing that she likes to see so much. You have to spoil your parents sometimes you know. I'm going back to cuddle with whoever is available. It's been a busy weekend. Dad has been sickies with lumbar pain. So I have been busy giving him Pei-vibes to get better. It must be working, he's sitting up now instead of lying down. I wanted to make sure that this picture went out though. These are the cookies Aunt Sharon and Uncle Marty gave to Mom to give to me. Mailman Fingers! (no mailmen, women or puppies were injured in making these cookies). OK, I need to get back to snoopervising Dad getting better, and Puppy have a snooze. Remind me to tell you about Puppy's new kennel next time.